The Liberal Party standard bearer Mar Roxas has already conceded defeat to the soon to be the proclaim President of the Philippines Rodrigo Roa Duterte. Aside from Roxas, Sen. Grace Poe and Vice Presidential Jejomar Binay are also conceded to former Mayor Duterte. However, Atty. 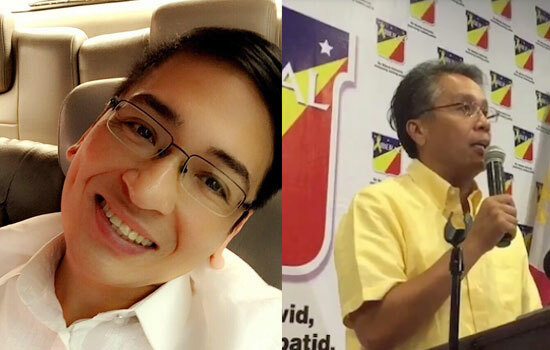 Bruce Rivera has another new and hot thoughts about the rescheduled presscon of Mar Roxas. He called Mar as 'gentlemen' and mentioned also Sec. Coloma as proxy spearker for President Aquino III. As he said about Sec. Coloma, "I pity the man. Imagine speaking for a brat. I think speaking for Napoles was way easier kasi pag may mali akong nasabi, Jenny will not throw a tantrum." You know already who is the person he was reffering to right? the 'brat.' Well, its good to read his full-text of Bruce's thoughts posted on his FB wall. SEC. MAR HAS CONCEDED. WHERE IS BENIGNO SIMEON? In a rescheduled presscon, LP bet Roxas conceded and asked his supporters to be part of the leadership of Tatay Digong. I expected that from Mar. He is truly a gentlemen. I just hope that his mining connections will be explained so people will see him in a different light. Who knows. Later on, Sec. Coloma held a press briefing and gave a very meagerly-worded acceptance of defeat. It looked like Coloma was almost afraid to say words akin to congratulations that he sounded well, like a spokesperson. I pity the man. Imagine speaking for a brat. I think speaking for Napoles was way easier kasi pag may mali akong nasabi, Jenny will not throw a tantrum. But that is not what bothers me. There are LP people I honestly admire. And not having a strong party system, it is something nornal for a thinking Filipino. I said in the past that I am not averse to a Robredo, Marcos or Cayetano VP. Hwag lang po si Trillanes kasi parang nag-aalaga ka ng ahas na kasama mo sa Malacañan. Imagine the Cabinet meetings if he decides to walk out. But this election, the distinction of Best Performance by an Anti-Duterte is shared by Trillanes and PNoy. Sorry Carlos, I only award it to human jerks. There is still no verdict if you are human or a figment of our imagination, so evil, its unreal. But I got to hand it to our outgoing President. He is consistently unstatesmanlike. I think Mar should seriously think of getting back at him. He gave up his bid in 2010 and PNoy manages to destroy his chances in 2016. I even have a distinct feeling that if he had his way, he would junk Mar and choose Grace. That would have been interesting. The reason I am not a fan of Pnoy is his inability to be selfless. It is always about him, his family, his opinion, his anger, his demons. Him. He is running our country and his expectation is because he is running the show, his feeling is the only thing that matters. Our feelings are just incidental. When Jennifer Laude died, he feeling was that he does not go to the wake of people he does not know. Despite the fact that Laude died because an American soldier killed her because he discovered that she was a trangender. He refused to be there on the arrival of the SAF44 victims and when blamed for it, retorted back and reminded the victims that he too, lost a father. As if telling them, your pain is nothing compared to mine. You lost a husband or son but I lost a hero as if telling the victim's family to spare him their crap, he suffered too. When everyone has virtually conceded and congratulated Duterte for his victory, the first one who should do it is no less than the sitting President. As the one who will relinquish the office to Duterte, he should be the first one to extend the unifying hand to his successor. The honor extolled to him by GMA which he disregarded and snubbed because he will be using GMA as a reason for all the problems of the republic. Humility is expected from a statesman and a President. PNoy never learned that value. It is humility that would have Pnoy be grateful and humble in victory and gracious in defeat especially towards a President with an overwhelming mandate, his mandate pales in comparison. His silence is disturbing because it leaves a bitter taste in the mouth. So bitter, people who voted for you have been apologizing that you happened in our history. Filipinos are forgiving and proof of that is the fact that BBM actually has a shot to be VP; something impossible 30 years ago. Why is that possible? Because Marcos left like a statesman. He could use force but chose not to thereby giving EDSA 1 its unique monicker as a peaceful revolution. So those who saw him leave, the man in a hat looking sad but dignified, will likely remember that act of statesmanship that the evils of Martial Law take on secondary signification. Thirty years from now, if you still insist being the brat you appear to be, the last image we will have of you is that bald immature man wearing yellow saying you cannot allow a dictator to win an election because you felt it was destroying the legacy of your father. Your feelings again. How about the feelings of majority of the people who voted for him? Like we never existed. Thirty years from now, that is what we will remember. A spoiled brat. And I do not know if Filipinos can be as forgiving to spoiled brats. Do you agree with Atty. Rivera's thoughts? Share your opinion below. Comments or suggestions about "Mar Roxas has Conceded,'WHERE IS BENIGNO SIMEON?' by Bruce Rivera" is important to us, you may share it by using the comment box below.